Even in today's 21st century Army, where some soldiers are now trained to hit their target from the opposite hemisphere with unmanned aircraft, there's still a place for the fundamental relationship between canines and their handlers in military occupational specialty (MOS) 31K. Military working dog (MWD) teams are always at work, both at home and abroad, supporting combat missions or daily law enforcement. In fact, regulations prohibit loading extra assignments on a K-9 handler that would interfere with his or her primary duties. MOS 31K doesn't exist just so that some soldiers can get paid to have a dog, of course. 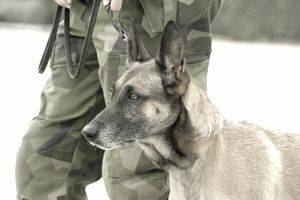 Military working dogs are employed primarily to search either for narcotic drugs or explosives. In fact, canines can only be trained to search for one or the other throughout their careers, to keep their snouts specialized. Dogs may also be trained as combat trackers or patrol dogs, and may be required to conduct Secret Service missions, as well as health and welfare inspections. Formerly a specialized skill set for soldiers who already had a primary MOS, military working dog handler became its own full-fledged MOS in 2012. Applicants for this job need to pass a medical screen and a background check, obtain a passport, and successfully complete an interview with the kennel master or unit commander in order to qualify for this voluntary assignment. In additional prospective handlers must exhibit a high degree of affection for their animal. The working dog program's philosophy is "one dog, one handler" until the dog retires from service. The bond between handler and animal should be strong, since they may rely on each other in a combat situation or other high-stakes situation. Handlers are trained for 11 weeks at Lackland Air Force Base in Texas. (The Air Force heads up the working dog program for the entire Department of Defense.) The training course covers such topics as care, feeding, and grooming, including doggy first aid, how to maintain obedience and control aggression, searching, scouting and patrolling and learning how to handle conditions when under gunfire. Also, once paired up, a soldier/dog team must be certified ready for work before they can move forward, and re-certify each year. Certification includes odor recognition, appropriate use of dummy explosives and narcotics to keep the dog sharp, and practice searches of a variety of areas such as vehicles, barracks, luggage, warehouses and various open areas. Just to be clear, certification isn't all on the dog. The regulation suggests that handlers get two strikes — a chance to certify with two dogs — before failure means you're booted from the MOS. But most handlers bond relatively easily with their dogs, and work to keep the connection with the animal strong. Career Profile: What Does It Take to Be an Army Physician Assistant?